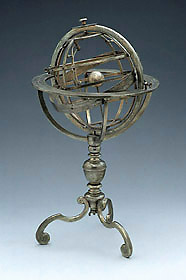 This very fine armillary sphere includes the sun and moon revolving around a central and stationary earth, with the moon mounted on a small circle known in the astronomy of the time as an epicycle. There is a greater interest in individual stars than usual, a number being marked on the horizon and ecliptic rings, and by means of individual pointers. One interesting feature of the construction of this sphere is that its spindle can easily be removed from the stand, by unscrewing a nut in the base. The instrument can then by held by the hand, in the manner in which these instruments are often portrayed in portraits from the period. This may in part explain the unusual provision of three clamping screws to hold the adjustable meridian ring in place.